The Dalmatian is a distinctively spotted dog; well balanced, strong, muscular and active, free from coarseness and lumber, capable of great endurance and speed compatible to its purpose. A lively, active dog of good demeanour. Males: 22-24 inches (56-61 cm), Females: 21-23 inches (53-58 cm). The coat should be short dense and fine, slightly glossy neither woolly nor silky. The colour and markings are most important. 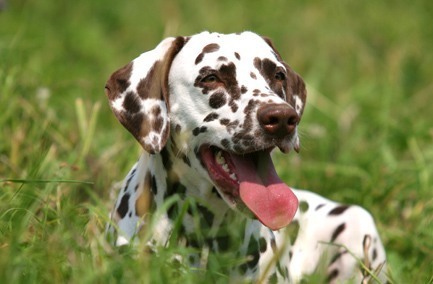 There are two acceptable colours: white with black spots and white with liver spots. The ground colour should be pure white. “Dals” are generally highly active dogs with moderate trainability. They can be shy with strangers and nervous in noisy, active households. Their short coat sheds consistently – in black and white! – but grooming needs are negligible. Medical concerns include congenital deafness and a rare type of bladder stone (urate).